Singapore has been hit by severe haze from forest fires in nearby Indonesia, prompting a health alert from the government. The Pollutant Standards Index (PSI) reached 155 on Monday evening, well above the healthy limit of 100, and the highest level since 1997. Outdoor physical activity should be avoided, and vulnerable people should stay indoors, the government said. The haze is expected to last for the next few days, the government added. In Singapore, the view of many landmarks and buildings was obscured by the haze, and the smell of burnt wood was noticeable in the city. Parts of neighbouring Malaysia have also been caught up in the haze, with the air quality reaching unhealthy levels in some states, Malaysia's Department of Environment said. In a statement on Monday, Singapore's National Environment Agency said winds had brought over the smoke haze from fires in Sumatra, Indonesia. It said it had "urged the Indonesian authorities to look into urgent measures to mitigate the transboundary haze occurrence". Singapore's Environment Minister Dr Vivian Balakrishnan said that "for too long, commercial interests in Indonesia have been allowed to override environmental concerns". However, an Indonesian official said that Singaporean and Malaysian investors also bore some responsibility for the fires, AFP news agency reported. "The slash-and-burn technique being used is the cheapest land-clearing method and it is not only used by local farmers, but also employees of palm oil investors including Singaporean and Malaysian companies," Hadi Daryanto, an official at Indonesia's Forestry Ministry, said. "We hope the governments of Malaysia and Singapore will tell their investors to adopt proper measures so we can solve this problem together." Indonesia said it had deployed firefighters to try and contain the blazes. 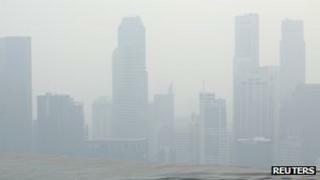 The South East Asia haze in 1997 and 1998 covered Indonesia, Malaysia, Singapore, Brunei and the southern Philippines, causing environmental damage and, by some estimates, around $9.3bn (£5.9bn) in economic losses. Tourist numbers to the region fell sharply, and reports said the smog made around 20 million people ill. The smoke also contributed to collisions on the roads and at sea, and a number of air disasters were blamed on poor visibility.